If you have ever wondered if it is really possible to do some of the things that superheroes do, this is your chance to see the stuff of comic books and Hollywood movies put to the test. 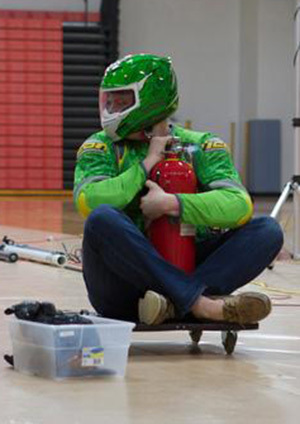 The Wabash College Society of Physics Students (SPS) will present the science behind such superpowers and more in the 2014 Physics Demonstration Show, “The Physics of Superheroes,” at 7 p.m. on Wednesday, March 19 in the Fine Art Center’s Ball Theater. The seventh-annual demonstration addresses the physics behind superpower stalwarts like seeing through solid objects, control lightning, using magnetic powers to move metal, exploding matter with laser beams, and exponentially increasing the size of ordinary items. Be there for this one-night-only show as comic book pages come to life. Admission is free and open to the public, but seating is limited. The show is generously supported by the Wabash College Student Senate.